​Kazakhstan is the largest landlocked country in the world and the ninth largest overall, yet it’s home to just 17 million people, about half that of California. It shares its borders with Russia to the north, China to the west, and Kyrgyzstan, Uzbekistan and Turkmenistan the south. It’s where apples, garlic and tulips come from. Indeed the tulip is its national flower and it’s home to some of the world’s rarest – 37 original and unique species. Wildlife includes red bears, snow leopards and a wide variety of bird life including golden eagles, flamingos and falcons. It’s a bird-watcher’s paradise. It is also so safe that after a night out on the town, people confidently stand at the roadsides to hitch rides home with total strangers. 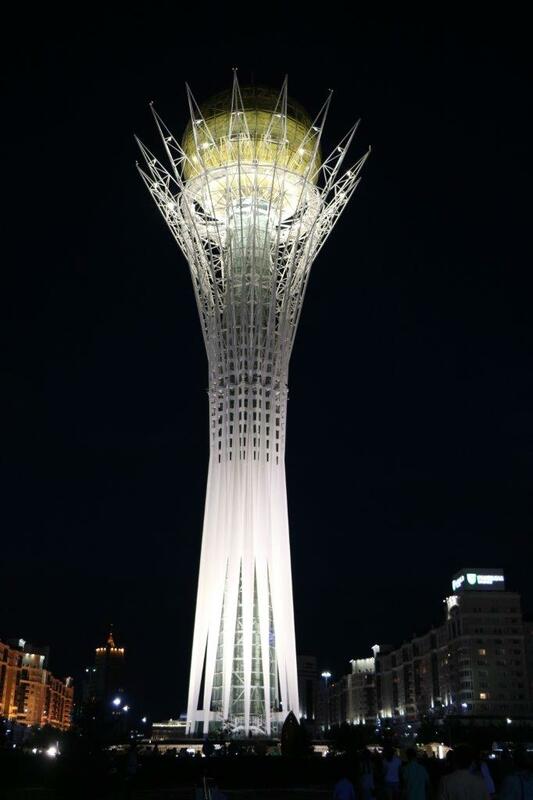 The two major cities in Kazakhstan are traditional Almaty, the former capital, and brand-new Astana the current capital, and these two cities were on my itinerary. I used Holiday Extras’ valet parking service at Heathrow Terminal 4 and checked in with Air Astana. It’s the only airline offering direct flights to Astana, from where I had a connection for the ninety minute flight to Almaty; my luggage was booked through. The four-star airline, headed up by Yorkshireman Peter Foster, has won the title “Best Airline in Central Asia and India” for five consecutive years and "The Best Airline Staff Service in Central Asia/India" for the last six years. As you can imagine, the onboard service is excellent. ​Kazakhstan gained independence from the USSR in 1991 and Almaty was the capital until 1997. It is the largest city in the country and has numerous restaurants and hotels. Although the population is over 70% Muslim there is no sign of religious clothing or hair covering. Modern Western or Russian clothes are the norm. I stayed at the Holiday Inn and ate lunches and dinners at a variety of restaurants along with other visitors. The food was good although menus in English are not that plentiful. However, they have pictures of the dishes so you can see what you are ordering. Kazakh and Russian have been the two official languages for many years but English is now also compulsory in schools although it will take a little time for this to work through the system. The local currency, the Tenge (KZT), has suffered a devaluation so prices are inexpensive by most standards. Many places also accept US dollars and, of course, plastic. Next day I joined a guided tour and visited Panfilov Park, home to the magnificent Russian Orthodox Zenkov Cathedral, the largest wooden cathedral in the world. It was traditionally built without nails. 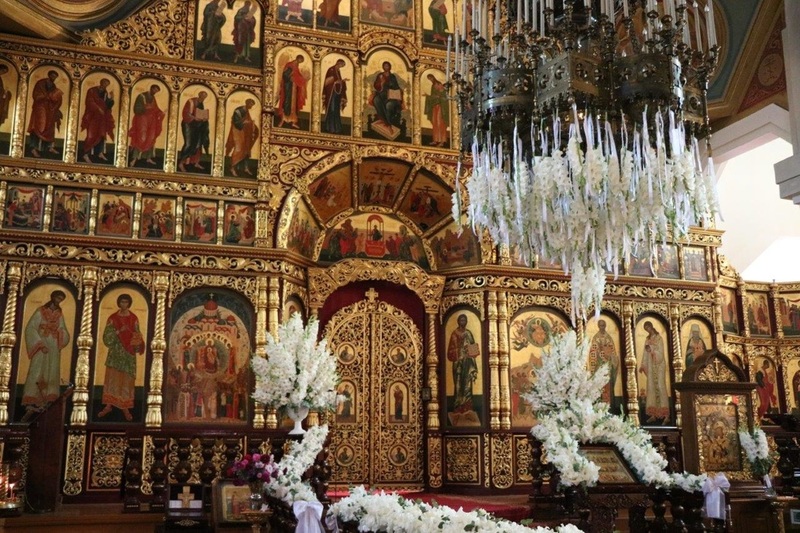 The interior is just as impressive as the exterior; it’s an oasis of calm with the gentle chanting of a priest and magnificent painted screens. The park itself is a memorial to soldiers lost in the two world wars and one memorial contains part of the old Berlin Wall. 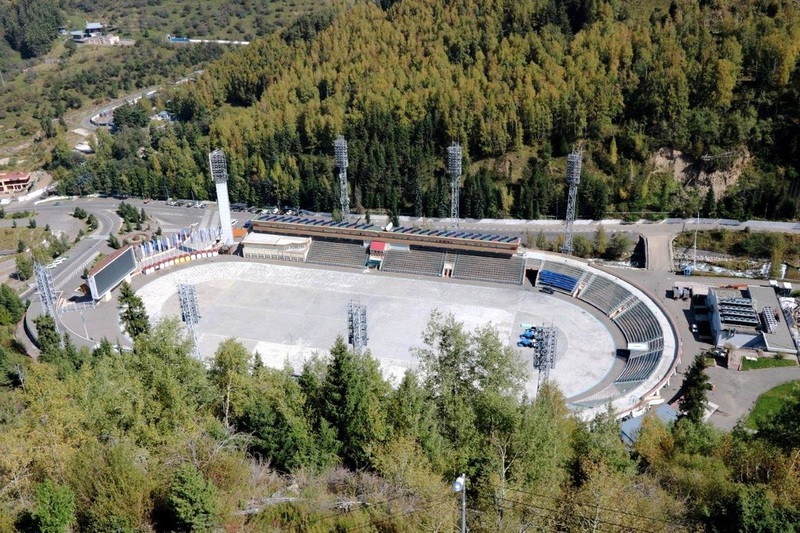 ​Almaty is close to a mountain range and narrowly lost out to Beijing to host the 2022 Winter Olympics. The Medeu dam, basically a wall of rocks and earth, was built to protect the city from major mud slides. Next to it sits the Medeu skating rink, at over 5,500ft above sea level it’s the world’s highest. The conditions are so good that around 200 world records have been broken here. ​The surrounding hills make it a winter sun trap and the winter temperature can reach fifteen degrees. Our guide tells us, with a glint in his eye, that girls skate in bikinis and it’s where many boys meet their future wives. Speed skating meets speed dating! 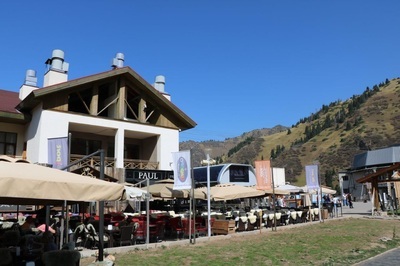 ​The main ski centre, Shymbulak is reached from here by cable car, and another two take skiers to the top of the runs at 10,500ft. Shymbulak’s guest list includes Prince Harry. 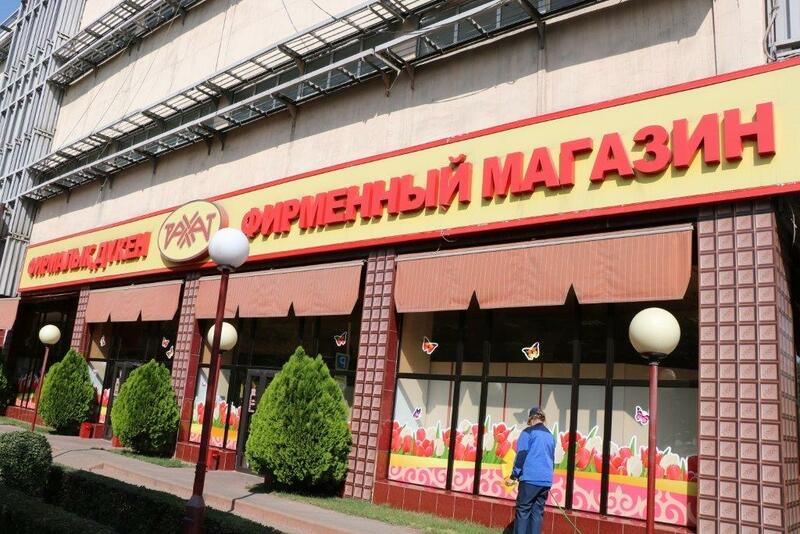 Almaty is also home to Rakhat who makes some of the best chocolate I have even tasted. I think the Swiss and the Belgians need to watch out! ​​Next day it’s back to the airport for a ninety minute flight from the old capital to the new. 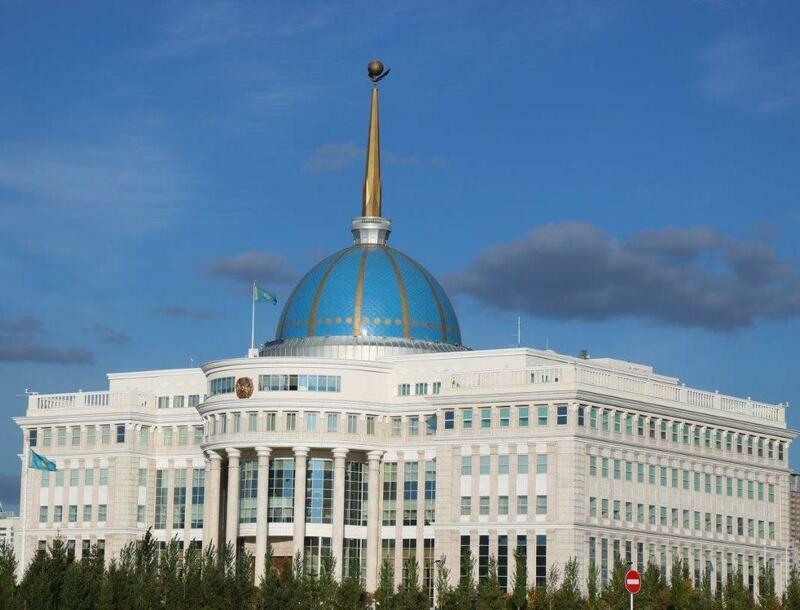 Astana, my second destination is, like Brasilia and Canberra, a purpose-built capital city. CNN described it as the world’s weirdest capital city, and not without some justification, but I think ‘stunning’ would be a better description. 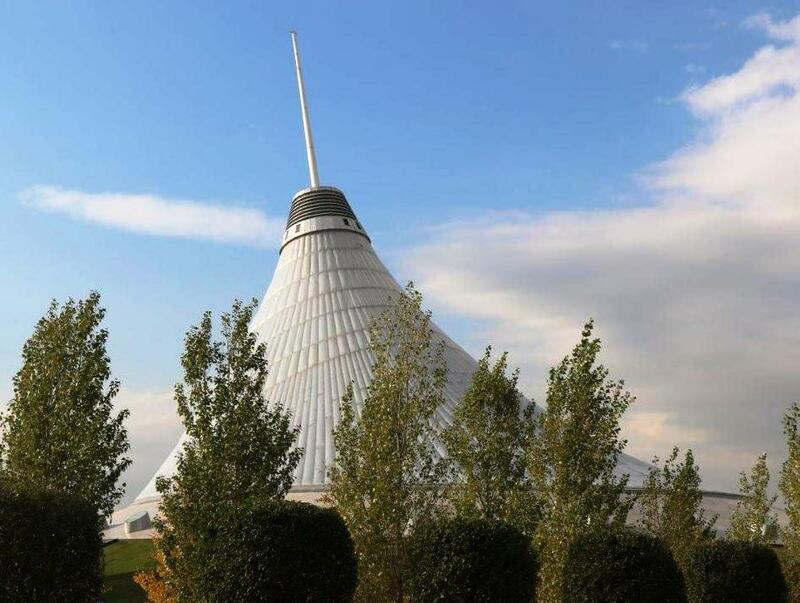 British architect Norman Foster desgned some of its amazing structures including the Khan Shatyr shopping mall, the world's largest tent. There are three levels of shops, mostly familiar brands, but on the fourth floor is the indoor Sky Beach Club, complete with sandy beach and sun-beds. How bizarre that for around $30 you can spend a day at the beach in the world's largest landlocked country! Norman Foster also designed the pyramid-shaped Palace of Peace and Reconciliation. 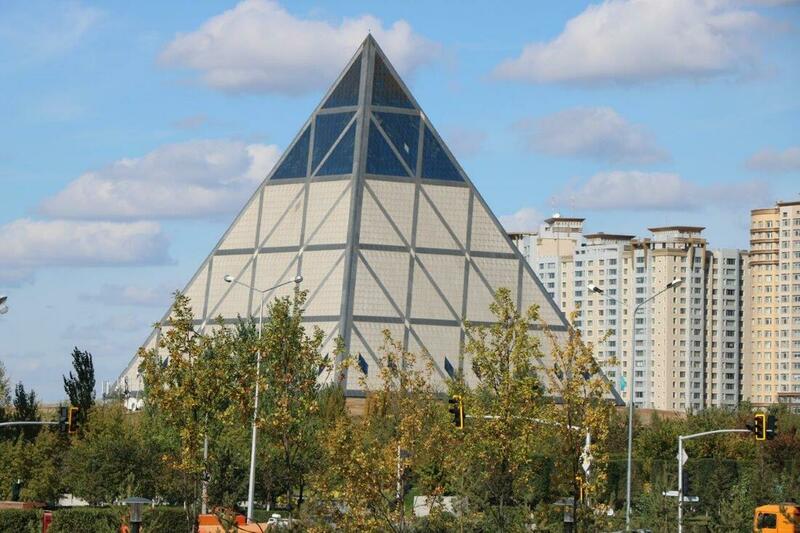 Because the temperature in Astana ranges from 30 degrees in summer to minus 40 degrees in winter, two sides of the pyramid had to be on roller bearings to allow for contraction and expansion. I got as close as I was allowed to the presidential palace, a cross between the White House and a mosque, and was amazed at the nearby turquoise concert hall, a striking and unique design. I then went on to Baiterek, which looked like a 300ft high football trophy (first picture), and an art gallery that resembled a huge doggy bowl. 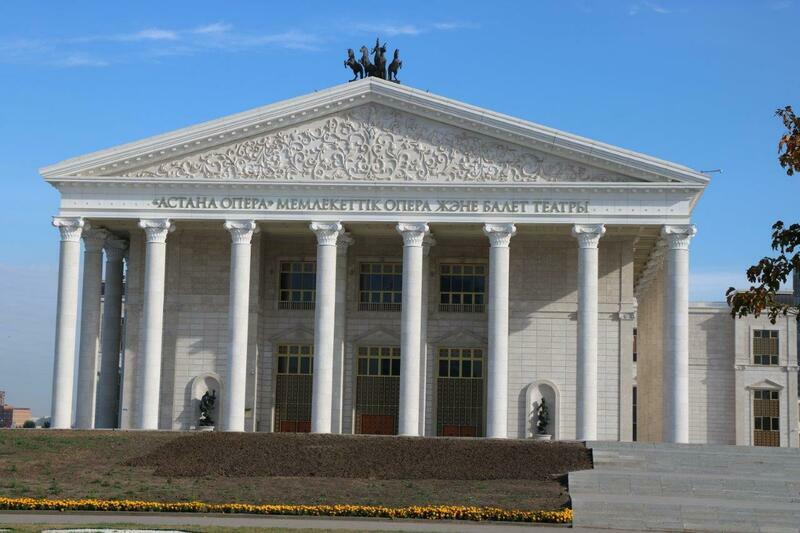 I later visited the opera house built in the style of a Roman temple. These are just a few of the amazing structures in the great city. ​The country’s rich mineral deposits include oil and gas, and its mining industry includes uranium, chrome and gold. 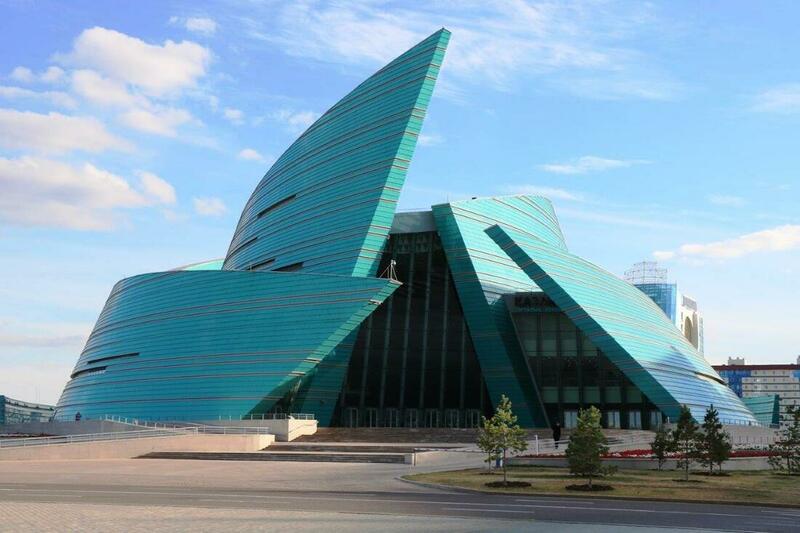 The ultra-modern museum in Astana has a Gold Room with a magnificent collection of over four thousand gold items, including a suit of armour, dating back to 4th and 5th centuries BC in perfect condition. It looks more like an expensive Bond Street jewellers. 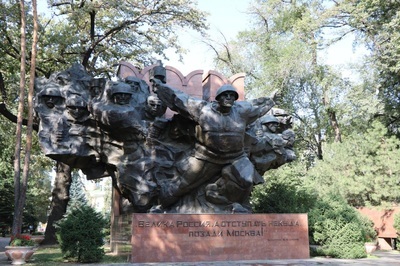 There is so much more to this amazing country that I have yet to see, including the Baikonur Cosmodrome, the world’s first and largest operational space launch facility. 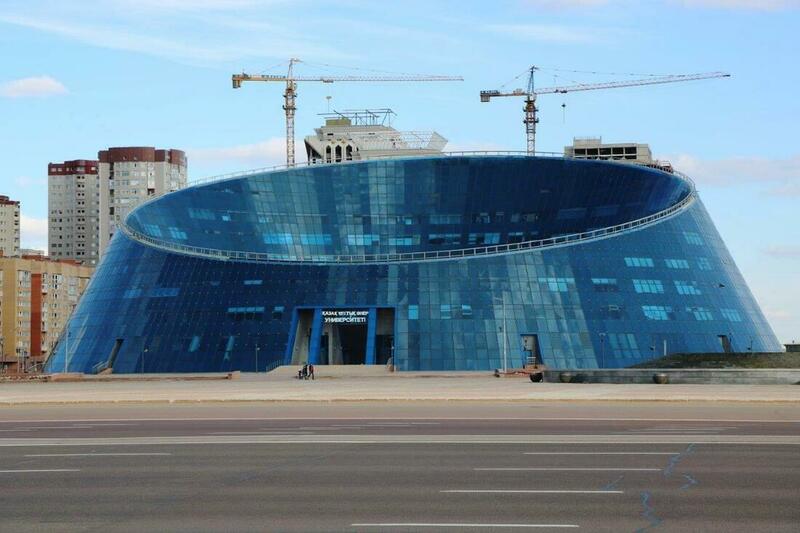 It’s where Sputnik, the world’s first satellite, was launched and later Yuri Gagarin, the first man in space. More recent launches have included Englishman Tim Peake and recently-retired American Peggy Whitson, at 58 the oldest woman in space and with more space miles than any other NASA astronaut. Then there’s Tien-Shan, a vast mountain area, full of rare birds and animals, and the Karagiye Depression which drops to 433ft (132m) below sea level; it is home to a range of unique creatures and some edible wild mushrooms. The country also attracts meteorites. One created the Zhamanshin crater, a staggering nine miles in diameter and nearly a million years old. 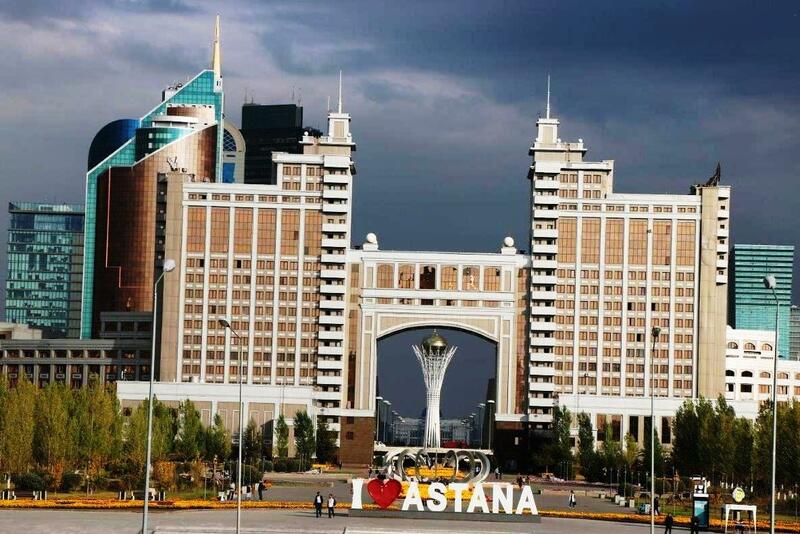 Astana and Almaty are two great contrasting cities and well worth a visit in their own right. However, there is so much more to this vast intriguing country and I look forward to going back and seeing more of what it has to offer. 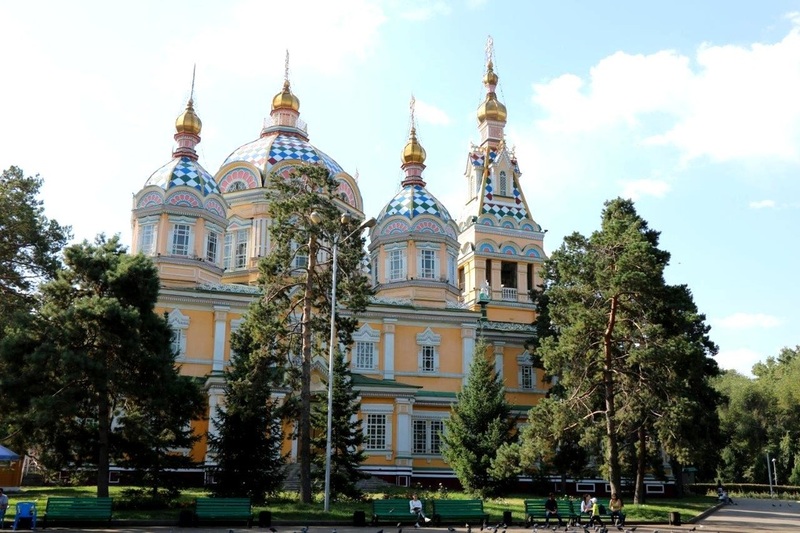 Air Astana offers return flights between Heathrow and Astana from £492 year-round. Air Astana Holidays can add transfers and hotel accommodation to make up a complete package. 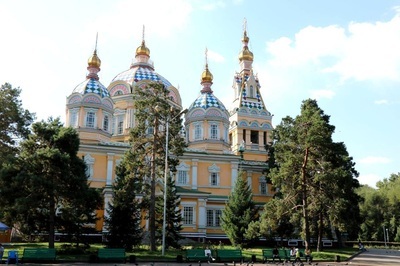 For example three nights in Almaty and three in Astana with all flights, transfers and hotels on a B&B basis costs from just £816 per passenger. This includes city tours of Almaty and Astana and a seasonal bonus, such as a visit to the Arasan Baths in Almaty or a day skiing at Shymbulak. Optional extras include Trekking, Mountain Biking and Golf . Go to http://airastana.com/uk/en-US , telephone +7 (727) 244 44 77 or contact the London office on 020 7333 0196, Mon-Fri, 0900 – 1730. Holiday Extras offers trusted Meet and Greet parking, lounges and other services at all major UK airports. Visit www.holidayextras.com or call 0800 1313 777.